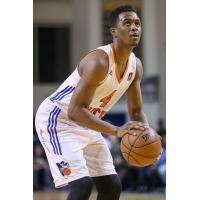 WHITE PLAINS, March 31, 2015 - The Westchester Knicks, the official NBA Development League affiliate of the New York Knickerbockers, announced today Doron Lamb has suffered a season-ending wrist injury. Westchester will retain his NBA D-League rights for the next two seasons. Lamb, 6-4, 210 pounds, appeared in 14 games for Westchester, averaging 17.7 points, 4.4 rebounds, and 2.4 assists over 40.0 minutes of play. He currently holds the franchise record for most points scored in a single game, notching 40 points in a loss to the Iowa Energy on March 12, 2015. Lamb was originally acquired in a trade with the Texas Legends in exchange for the Idaho Stampede's 2015 2nd round pick and the returning player rights to Luke Harangody and Jeff Adrien. The Westchester Knicks embark on the last road trip of the season starting with a game on Wednesday, April 1 to take on the Iowa Energy, the Memphis Grizzlies' affiliate. The game will be broadcast live on MSG+ and the D-League's YouTube channel. Tickets for the final home game of the inaugural season are on sale now at Ticketmaster outlets and the Westchester County Center Box Office and start at $10. The Westchester Knicks close out the season on Saturday, April 4 at 7:00 p.m. against the Canton Charge. For information on 2015-16 season tickets, visit WestchesterKnicks.com or call (914) 559-6889. Fans can stay up-to-date on team news by following the team at: @wcknicks on Twitter and on Facebook at facebook.com/wcknicks.